Tesco is set to become the UK's largest retailer of non-food goods by the end of the year, according to industry analysts Verdict Research. Tesco will leapfrog ARG, owner of Argos and Homebase, by the end of 2006 as it sells more than £6bn of non-food goods. It has expanded into most areas of the retail market, selling clothes, books, electrical goods and seasonal items such as barbecues and garden furniture. Verdict said it expected some retailers to fold in the face of Tesco's growth. "Compounded by the effect of rising costs and more demanding customers, casualties from almost every corner of the market are inevitable," the firm said in a study of trends in non-food retailing. Tesco has been capitalising on its size and customer loyalty to make big gains in the non-food market, selling goods ranging from £3 pairs of jeans to soft furnishings and jewellery. It is devoting increasing space to non-food goods in its large format Extra stores, and opened its first entirely non-food store last year. Last year it appointed Terry Green, the former chief executive of BhS, Debenhams and Topshop, to develop its clothing ranges. 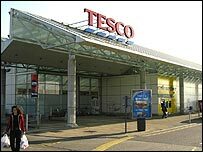 "Tesco is certain to extend its lead going forward," said Alastair Lockhart, senior retail analyst at Verdict Research. "It is skilfully enhancing its ranges across all categories. "We can expect to see a lot more clothing, homewares and electricals goods in Tesco's stores. Ranges will be broader and the way product is displayed will improve." Tesco says its strategy is to be "as strong in non-food as in food", emphasising quality, range, price and service. Sales of non-food goods are currently growing at twice the rate of food products, driven by the increasing incursion of Tesco, Asda and Sainsbury's into the market. By next year, Verdict expects supermarkets to take £1 in every £10 spent on non-food goods. The ability to offer low prices, a wide choice and a convenient shopping experience has seen supermarkets make ground at the expense of other retailers, in areas such as drugs and entertainment products. Boots and HMV are among retailers which have seen their sales eroded by supermarkets in recent years. Verdict said this trend was likely to continue. "Whereas in the past, grocers have typically taken a fairly opportunistic approach in their non-food development, they are now placed to take on specialist retailers head-to-head," Mr Lockhart said. 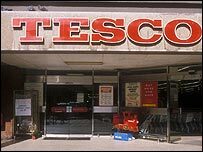 Separately, it has emerged that Tesco has registered two companies in the US as a prelude to its £250m expansion there. Tesco is opening its first convenience stores there next year and real estate experts believe it is currently looking for sites in Las Vegas as well as other cities.